22 Channels Each with 121 Privacy Codes: With 22 channels and 121 privacy codes, amassing 2,662 combinations, it’s simple to locate an available channel. There are a couple of ways to power your radio: work with the included NiMH rechargeable batteries for approximately 10 hours or use 3 AA batteries for about 29 hours. 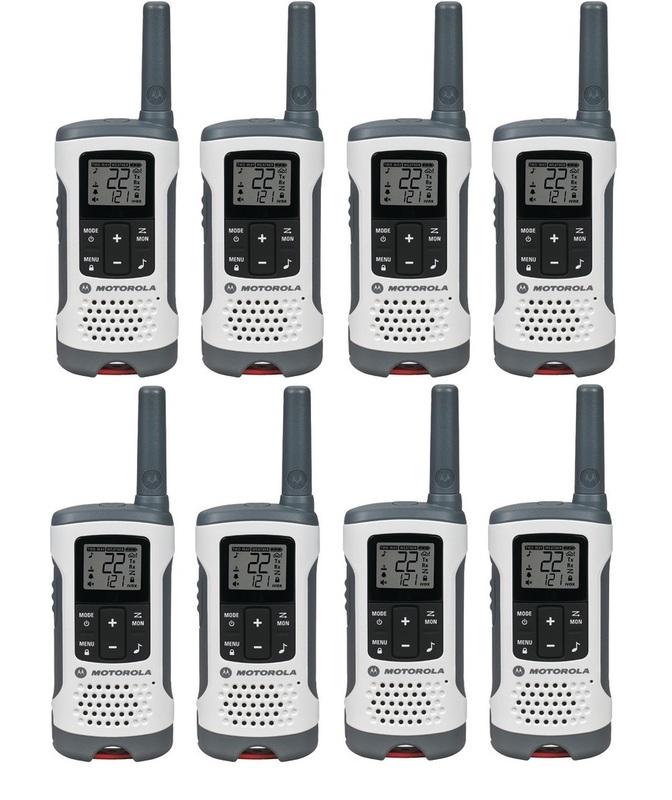 Works with Any Radio: It’s possible to communicate with other FRS/GMRS radios irrespective of brand when they are on the same channel and privacy codes. Be aware of Weather Beforehand: Keep updated with real-time climate conditions by activating one of 11 weather channels or triggering weather alerts. NOAA radio service might not be available in every area. Identify a Channel: Make use of the scanning feature to determine which channels are presently being used. Low Battery Alert: Low battery alert tells you when batteries are running low. Stay in close communication with everyone in your party no matter how far they wander with the Talkabout T260. Enjoy constant contact while you’re camping, hiking, fishing or sailing even when you’re out of cell phone range. Make sure that no matter what’s going on ahead, whether it’s stormy seas or a spectacular view, that you are never out of touch. When you’re enjoying the great outdoors, especially if you’re a fan of climbing snowy peaks, you always need to know what to expect. Tune into one of the 11 weather channels and initiate weather alerts so you’re forewarned of upcoming storms. Make sure the NOAA radio service is available in the area you’re visiting by checking with your local weather office at www.weather.gov/nwr. Canadians, go to www.msc.ec.gc.ca/msb/weatheradio. In clear conditions, you can contact people up to 25 miles away. If you’re in open water, chat with folks 6 miles away or 1 mile away in your neighborhood. Actual communication range will vary depending upon weather conditions, topical obstructions and terrain, and potential electromagnetic interference. In other words, always test your range before you assume anything. Safety first! Use your T260 like a speakerphone thanks to the iVOX/VOX feature. Keep on moving up the side of that mountain or down the trail and answer a call with the ultimate convenience, even when you’re in completely remote locations. Recharge your NiMH batteries anywhere there’s a power source for up to 12 hours of use. Charge up using a vehicle adapter, USB port on your computer, or an electrical outlet. Keep 3 AA batteries as back-up and enjoy an additional 29 hours of uptime. You’ll get an automatic low battery warning when you start to run out of juice. Use the timeout timer to make sure that your transmissions are successfully concluded to prevent draining the batteries further. When you’re enjoying the great outdoors, you may want some variety outside of a standard ringtone. Select from 20 call tones so people know when you’re ringing them. Set up discrete channels with the available 22 channels and 121 privacy codes for a total of 2,662 potential combinations. Always have access to an open channel during peak season. Use the scanning feature to find an open channel automatically so you can start up communications quickly. Weighing only 4 ounces, or 0.25 pounds, you’ll hardly notice the T260 sitting on your belt loop as you bike, ski, snowboard or hike. At a mere 6 inches high, it’s easy to handle and pack up. The backlit interface makes it easy to use after dark or in low-light conditions. Even you cave spelunkers can see what you’re doing. Use the keypad lock to add a security feature so no one can inadvertently reset your profile settings. Eco-smart technology conserves precious battery life while the radio is idle. This feature also uses less energy while the radio is charging, decreasing charging time and pulling less drain on the battery. 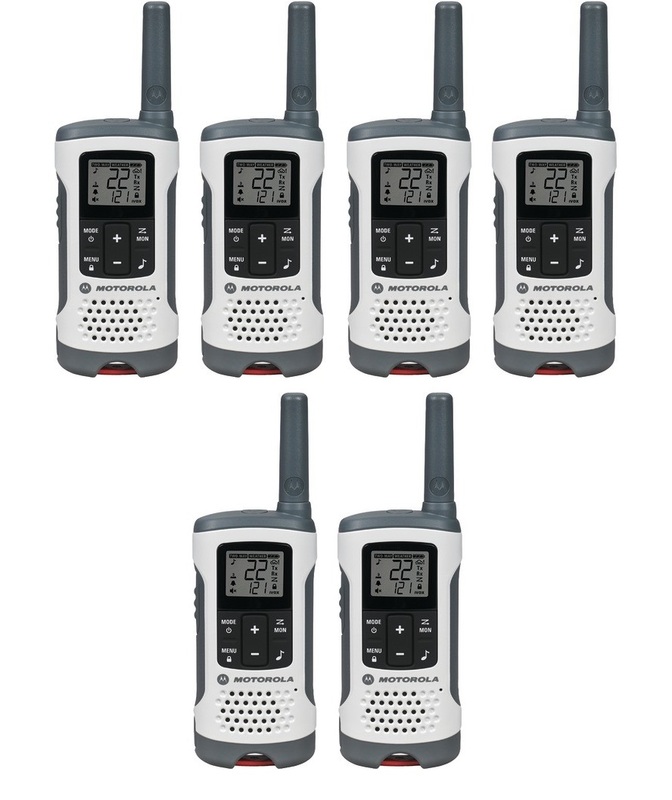 If you have any questions about the Motorola Talkabout T260 Walkie Talkie 6 Pack Radios , please don’t hesitate to contact us. All questions/comments are routed to our customer support team , so you WILL receive a prompt response!